UNIQUE AND CLASSIC: WizGear Tri Function Pen has a classic White combination like regular ballpoint pens. It also features a unique tri function feature that provides excellent value for money. CAPACTIVIE STYLUS: The capacitive stylus feature of the pen functions extremely well with regular and high-end touchscreens. It can be used on iOS devices like iPads, iPhones and Android Devices like Samsung, HTC, LG, Google nexus as well as windows Lumia and PC devices. The All in One Pen! Have you ever wanted a pen that is unique and offers more features than a regular pen, but you are having problems finding one? 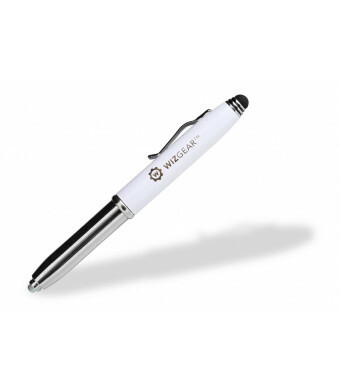 Get this WizGear tri-function pen today because it is exactly what you need! The WizGear tri function pen is one of the most unique brands of functional pens in the world. The pen is fully equipped with a collection of unique features that offer a wide range of benefits whenever and wherever. Being a Tri-function pen, the pen features a stylus, a led flashlight and a regular ballpoint pen all combined into one lightweight and extremely portable structure. The capacitive stylus function of the pen makes it useful on the touchscreens of smartphones, tablets and PCs. The LED flashlight is extremely useful as a mini searchlight when looking for small items or navigating through a dark place. It can be turned on and off by applying a little force to push the top of the pen. The regular writing feature of the pen comes in handy for your entire writing needs either at home or at the office. The pen comes with an ink compartment (for the writing function), button cell batteries (for the flashlight function), chrome accents and/or dual color brass barrels. The included ink compartment or cartridge is filled with black ink, while the LED the button cell batteries power flashlight. Although it is a tri-function pen, the overall design still feels extremely durable and looks elegant just like a regular high end pen. 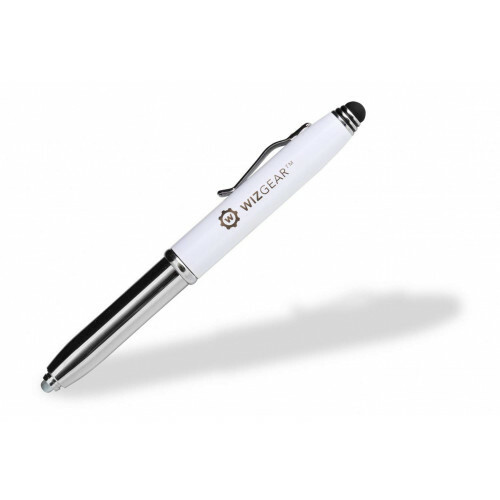 With its multiple functions and features, this WizGear tri function pen has been manufactured to come in handy whenever need to use a pen, stylus or a flashlight. It is designed to last long and provide excellent value for money. Get an WizGear Tri function pen today for yourself or for your family!